Humanity's dominance over the natural world is inextricably bound to our ability to modify our surroundings to suit our needs and to exploit available resources to support our populations. And exploit we have! From the discovery of fire and the domestication of livestock to modern medicine and renewable energy generation, many of our biggest technological achievements throughout history have served to increase our dominion over nature. And very high on that list, in terms of enabling our survival, has been our domestication of crops. Humans have been manipulating and modifying the genetic structures of plants since the domestication of cereal grains some 10,000 years ago. By selectively breeding individual plants that displayed desired qualities—larger edible bits, shorter growing cycles, you name it—humans slowly redesigned these organisms over the course of thousands of years. Of course, just because people knew how to domesticate crops doesn't mean they understood why it actually occurred. It wasn't until Gregor Mendel's 19th century investigation into trait inheritance by crossbreeding pea plants that modern genetic science emerged. While mutation breeding—the practice of exposing plants to chemicals and radiation in order to instigate a genetic change—has resulted in more than 2,000 commercially available plants over the past 100 years, it wasn't until the 1970s that we were able to directly affect the expression of a plant's genome thanks to the pioneering work of Herbert Boyer and Stanley Cohen. This direct intervention—known as genetic engineering—involves mutating, deleting, or adding genetic material to achieve the desired effect. And that's what brings us to GMOs. Generally speaking, genetically modified organisms fall into one of two broad categories depending on the method of their modification. Cisgenic modification is similar to what occurs in nature; swapping genes among closely-related, sexually-compatible organisms, albeit with far greater precision than what Mendel first described. Transgenic modification, on the other hand, mixes and matches genes from radically divergent species, such as implanting jellyfish genes to produce glow-in-the-dark piglets and luminescent kittens, or introducing Bacillus thuringiensis genes into tobacco to make it more insect-resistant. The ability to withstand pests is just one of a number of traits that has been achieved using transgenic modification. Since the first GMO crop was planted in 1994, researchers and agricultural corporations have created crops with superior resistances to diseases, herbicides, and adverse conditions; augmented nutritional values and shelf life; and even the ability to produce valuable pharmaceuticals. But while GMO-derived products have been available on supermarket shelves since 1994—that's when Calgene debuted its Flavr Savr brand of slow-ripening tomatoes—the overwhelming majority of genetically modified food is produced in the form of cash crops. These include soybean, corn, and canola oil, which are used as a source of livestock feed as well as precursors for a variety of processed foods and biofuels. As of 2013, nearly 85 percent of the nation's corn production, 91 percent of its soybeans, and 88 percent of its cotton come from genetically modified stock. Similarly, 77 percent of the papayas now grown in Hawaii, which were being decimated by the Ringspot virus in the 1990's, are of the genetically engineered Rainbow variety and immune to the disease. All of which is to say that even if you don't think you're eating GMO foods, you probably come across them almost every single day in one form or another. Humans typically consume a minimum of 0.1 to 1 gram of DNA in their diet each day (Doerfler, 2000). Therefore, the transgene in a genetically engineered plant is not a new type of material to our digestive systems, and it is present in extremely small amounts. In transgenic corn, the transgenes represent about 0.0001% of the total DNA (Lemaux and Frey, 2002). Decades of research indicate that dietary DNA has no direct toxicity itself. On the contrary, exogenous nucleotides have been shown to play important beneficial roles in gut function and the immune system (Carver, 1999). Likewise, there is no compelling evidence for the incorporation and expression of plant-derived DNA, whether as a transgene or not, into the genomes of consuming organisms. Defense processes have evolved, including extensive hydrolytic breakdown of the DNA during digestion, excision of integrated foreign DNA from the host genome, and silencing of foreign gene expression by targeted DNA methylation, that prevent the incorporation or expression of foreign DNA (Doerfler, 1991, 2000). A May, 2000 report from the National Academy of Sciences similarly failed to find transgenic modification inherently dangerous. Additionally, a recent literature review published in the Journal of Agricultural and Food Chemistry found "overwhelming evidence" GM food production "is less disruptive of crop composition compared with traditional breeding, which itself has a tremendous history of safety." These assertions, however, run counter to the findings of a small number of highly-publicized studies, including one published in a 2012 issue of Food and Chemical Toxicology that suggested a link between the consumption of Bt corn and tumor growth in lab rats but has since been retracted. That's not to say someone couldn't develop an allergic reaction in the future, but so far, all clear. Government regulation of GM foods are insufficient and based on shoddy testing methods. Both the American FDA and the European Union have conducted exhaustive testing on GM crops for more than two decades. In fact, GM crops are among the most extensively tested crops ever added to the US food supply. That doesn't, however, automatically constitute a safe and effective testing methodology. In the U.S., regulation of genetically modified foods is conducted by a "coordinated framework" of federal agencies: the EPA, USDA, and FDA, specifically. However the FDA policy, which determines whether or not foods are safe for consumption, places responsibility on the food's producer to ensure the safety of the food, rather than an independent testing facility. Foods from genetically engineered plants must meet the same requirements, including safety requirements, as foods from traditionally bred plants. FDA has a consultation process that encourages developers of genetically engineered plants to consult with FDA before marketing their products. This process helps developers determine the necessary steps to ensure their food products are safe and lawful. The goal of the consultation process is to ensure that any safety or other regulatory issues related to a food product are resolved before commercial distribution. Foods from genetically engineered plants intended to be grown in the United States that have been evaluated by FDA through the consultation process have not gone on the market until the FDA's questions about the safety of such products have been resolved. However, if the FDA feels that a product may pose an increased risk of allergy compared to non modified stock, it does have the authority to prohibit, or at least restrict, its marketing and sale. So it's not as though the agency is completely toothless. 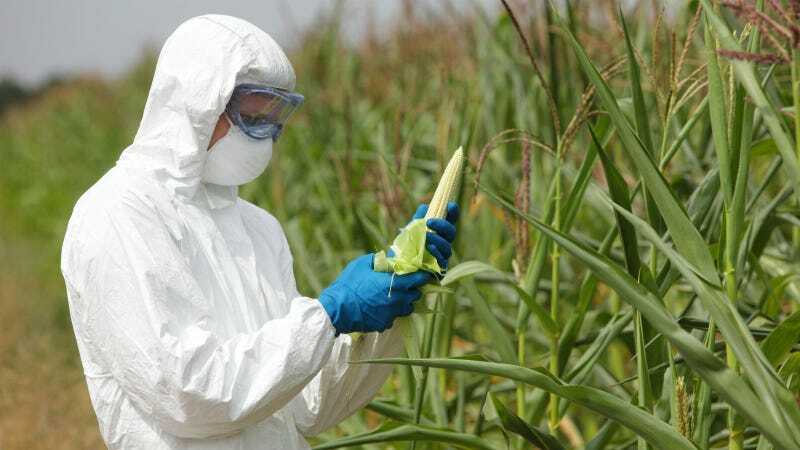 Applicants who wished to conduct field tests of GMOs were required to apply and submit an environmental risk assessment to the "competent authority" of the country where testing will occur. It further required another application to each Member State to market genetically-modified products and granted each Member States the right to object to such marketing within their borders. Under Article 16, any EU Member States may "provisionally restrict or prohibit' the use of sale of a product if it has "justifiable reason that an approved product poses a "risk to human health or the environment." This could explain why nearly three-quarters of all GM crops are grown in the US and virtually none are produced in the EU. Government regulators are in cahoots with Big Agriculture. Opponents of GM crops have repeatedly questioned the objectivity of federal regulators in regards to the consultation process, as well as the rigorousness of their testing. However these issues aren't malicious acts, merely symptoms of the voluntary nature of the FDA approval process. Evaluating the safety of food from a genetically engineered plant is a comprehensive process that includes several steps. Generally, the developer identifies the distinguishing attributes of new genetic traits and assesses whether any new material that a person consumed in food made from the genetically engineered plants could be toxic or allergenic. The developer also compares the levels of nutrients in the new genetically engineered plant to traditionally bred plants. This typically includes such nutrients as fiber, protein, fat, vitamins, and minerals. The developer includes this information in a safety assessment, which FDA's Biotechnology Evaluation Team then evaluates for safety and compliance with the law. The crop's developer tells the FDA what it did to the plant and what to look for, the FDA confirms that what the developer is saying is both true and meets federal safety guidelines. That's hardly collusion. Despite the European public's overwhelming distrust of GM foods, the European Union, as part of its Europe 2020 initiative, did spend a decade (and hundreds of millions of Euro) investigating the safety and efficiency of GMO products and found they posed no threat to its citizens' health. This includes the direct consumption of GM plants as well as their use in processed foods and as a livestock feed. "To date," Dr. Steven Novella, a neurologist at Yale University, told Mother Jones, "the reviews conclude pretty universally that there's just no health risk." A far more likely (and dangerous) scenario is one of over-reliance on these GM crops. Just as Nixon's farm bill in the 1970's inspired American farmers to grow corn, and only corn, thanks to cushy federal subsidies, the advent of new a GM crop could lead to farmers grow only that crop, and grow it in excess. This could potentially lead to the same issues we're currently facing with the Cavendish banana. See, the Cavendish accounts for nearly half of the world's annual banana crop and is overwhelmingly the choice of supermarkets throughout the Western World. It's also in the process of going extinct thanks to a ravaging fungal disease. Should GM foods, which already constitute a large part of the American food supply, suddenly go belly up, the economic effects could be devastating. Another issue lies in the proprietary nature of GM foods. Because agricultural corporations literally own these strains of crops as intellectual property, the potential for abuse or manipulation of the market—such as forcing farmers to buy new seed stock annually and suing those that save excess seed from season to season—is a very real possibility. What's more, as the line from Jurassic Park goes, "nature finds a way." Just as Methicillin-resistant Staphylococcus aureus evolved immunity to our most potent antibiotics due to the chemicals' severe over-prescription, growing just one GM crop—say, Bt corn, which produces its own insecticide—could potentially lead to the rise of "super-pests" that exhibit natural resistance to the corn's defenses. Think cross-pollinated weeds with the same resistance to Roundup brand pesticide as the corn that Roundup is meant to protect.